The countdown is on! Craft brewers and craft brew enthusiasts from BC and beyond will soon be gathering in Penticton to celebrate at the 23rd annual Okanagan Fest of Ale. A favourite for patrons and participants alike for over 20 years, this must attend event takes place at the Penticton Trade & Convention Centre April 13th and 14th in Penticton and features over 175 craft beers, cask ales and artisanal ciders from 69 exceptional craft breweries and cideries from BC and beyond. 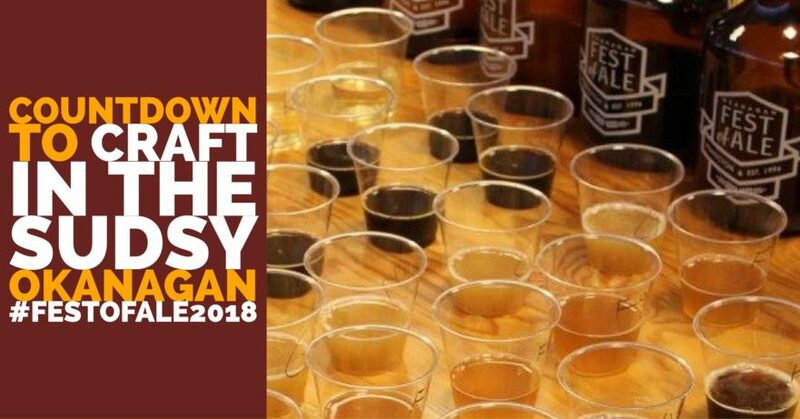 Of the participating breweries, 10 are new to the event, 5 will be featuring craft cider and many will be offering new seasonal releases and beers created especially for the festival. Guests of the fest can also look forward to fabulous food, with many restaurateurs incorporating a craft inspired twist on their dish, a brewing education station, onsite pop-up liquor store and great live entertainment both indoors and out. Tap into a great list of craft-themed events including a beer-paired dinner at The Nest & Nectar featuring craft beer from the Tin Whistle Brewery; “The History of Beer…in 59 minutes!” a fun filed educational seminar, hosted by The Thirsty Writer, Joe Wiebe at Bad Tattoo Brewing; Strange Brews for you to savour at the Craft Corner Kitchen; “Lethal Injection – Murderers Row Cask Event” at the Kettle Valley Station Pub; the “Hair of the Dog” buffet brunch at the Barking Parrot; and celebrate the end of the festivities on Sunday evening as you relax and wind down with some free live music at Cannery Brewing with songstress Mayia Robbie. With just under a month to go until the kegs roll in and the casks are tapped, organizers report ticket sales have topped their expectations and encourage anyone wishing to attend the event to purchase their tickets soon! Tickets at the door are subject to availability – don’t be disappointed and pick yours up in today!